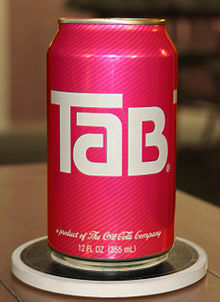 Tab Cola. For beautiful people. In the 1980s, one TV ad which was driving the Aussie boys crazy was a beachside promo piece for Tab Cola, the diet soft drink, featuring an 18 year old red bikini clad Elle The Body Macpherson. Tab, which was created in 1963, was the Coca Cola Company's answer to the rival Diet Rite, at that time the only sugar-free fizzy drink on the market. Elle of course, went on to become an International supermodel and business entrepreneur, flogging frilly underwear to the aspirational. Born Eleanor Gow in 1963 (coincidentally, the same year Tab was launched) in the well-heeled Upper North shore suburbs of Sydney, the lanky beauty reputedly has managed to amass a considerable personal fortune, ranging in the tens of millions. Not just a hot body then..?